Did you always want easily reach from top floor onto the lower in a building without waste of time? Redstone is a great solution of this problem. After using it, you can create a lot of fun mechanisms. On this map, you can test the fully working elevator. You must stand up on the block (the red circle in the screenshot). Then turn around and push the button. Minecraft PE 0.12.0 - beta testFirst, Tommy showed a screenshot of the 0.12 enchantment table. On the picture is located an indicator of hunger and experience! 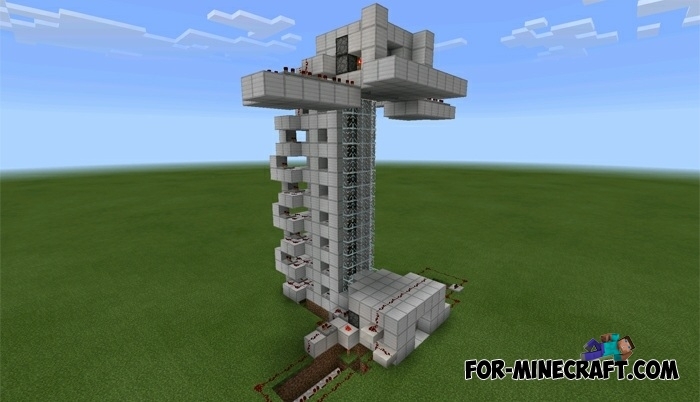 RhanCandia’s Elevator mod for Minecraft Pocket Edition 0.10.4Elevator will consist of several special blocks. During the construction of his house just set special block of the elevator, and then build a wall around it.